We are in the heart of our Destination: Paris week, so today’s post is dedicated to what we love most – beautiful inspiration! It’s no surprise that France and the City of Love have served as the inspo behind a handful of past photoshoots we’ve featured. Below, you’ll find three very different fashion shoots, so hopefully one will spark your fancy! In honor of this Destination: X week, we’ve also created a Pinterest board dedicated entirely to Paris. For all of the fashionistas out there, we’re also sharing a past “Adventures in Etiquette” article that’s about Navigating Fashion Faux Pas. Lastly, we previously had an expert in French fashion contribute six ways to Get Parisian Wedding Style. Pinterest has dominated the wedding planning world for years – with no signs of slowing down. We’re firmly aboard the bandwagon and love Pinterest as an inspirational resource for planning your dream destination wedding! In honor of our latest Destination: X week, we’ve created a Pinterest board entirely dedicated to Destination: Paris. Here you’ll discover lovely wedding dresses, ceremony set-ups, reception ideas and much more! The fun doesn’t end there, though. Be sure to check out our entire Pinterest page, which contains over 4,200 pins on everything from inspirational Fashion Forward photo shoots and Real Weddings to Signature Cocktail Ideas and Wedding Hair Style Ideas. When designing and planning your dream destination wedding, it’s important to have a clear vision and style for your big day. Thankfully, blogs like ours can offer inspiring photo shoots which were designed and executed by some of the industry’s best vendors. In this shoot titled French Romance, the talented group who participated got inspiration from the coordinator’s ancestry. Samantha Pereira with Memory Making Events traces her origins to France and the majority of her family still lives there. The idea was to recreate a vintage, yet modern setting. The group achieved inspirational details which speak to the French, chic lifestyle. By combining colors like teal, orange, magenta, rose pink, pale yellow and ivory, the reception set-up lent itself perfectly to a garden setting at Heritage Estates in Arroyo Grande, California. Feeling inspired? If so, please find the participating vendors’ information below! This photoshoot, "Fly Away with Me," was put together by an uber-fab group and is a romantic and quintessentially Parisian love story which will have you pulling out your passport for your destination wedding. 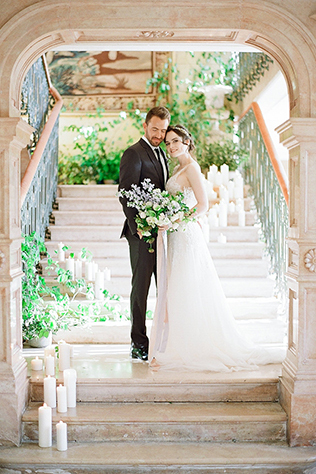 Get inspiration from the original "City of Love," one gorgeous Claire Pettibone gown and some great couple chemistry. Love what you see? 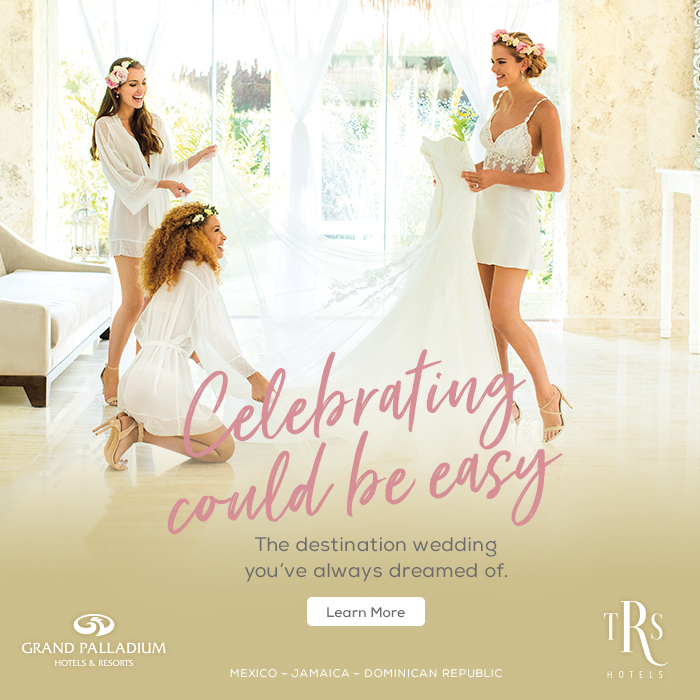 Reference our comprehensive vendor list below for more information and to learn how you can transform this iconic, romantic theme into your own destination wedding! Vendors: Photography: Alea Lovely Fine Art Photography, Reception Location: Hotel Phillips, Floral Design: Victorian Gardens, Cake: Classic Cakes, Dress: Claire Pettibone, HeadPiece: Twigs & Honey, Feather Bolero: Emmy Ray Designs, Makeup: James Professional MUA, Earrings: Forever 21, Groom’s Clothing: Zara, Parisian Parasol: Great Lookz, Stationery: Announce This! Wedding Stationery & Custom Design. *Note: The reception portion of this photo shoot was done in the United States. The photos of our bride in Paris were taken at a private residence. This article first appeared in Destination I Do's Fall2013/Winter 2014 issue. You can order a copy here. Every issue of Destination I Do includes our “Adventures in Etiquette” section, so we’re sharing a past article featuring common questions regarding fashion faux pas. With the French phrase being the headliner and Paris being one of the fashion capitals of the world, we felt it an appropriate piece to include in this Paris Destination: X week. A ‘faux pas’ can be described as a social blunder or indiscretion. In the world of fashion, there are many wardrobe choices that may raise eyebrows or cause tongues to wag. Revealing clothing and different tastes are just a few contemporary contenders for a potential ‘faux pas.’ Below, we’re answering some burning questions about wedding fashion blunders. Q: I have a handful of tattoos that my mother-in-law insists I cover up for my wedding day. I consider them a part of my identity and am proud to show off my tattoos. Should I stand my ground or acquiesce to keep the peace? Is there a general rule when it comes to tattoos and weddings? A: Tattoos have definitely become more commonplace in our culture and acceptable among many. That being said, there are some church venues that may have restrictions and there are people who take issue with body art. To me, the power struggle forming between you and your future mother-in-law is a greater issue. Forming respectful relationships is critical to harmony in the years to come. Talk to her about the importance of expressing yourself, but also listen to her perspective. See if you can think of possibilities to make this a win-win situation. One bride chose to use sheer detachable sleeves to camouflage her tattoos during the wedding ceremony and removed them for the reception. Fostering mutual respect within families can be an investment in your future happiness. Q: My husband and I are traveling to a part of the world we’ve never been to before for our honeymoon. I take pride in my personal style and love to wear the latest trends, but I’m concerned about cultural restrictions. Is there a resource for finding out fashion taboos in different parts of the world, i.e. what destinations expect covered shoulders and/or ankles? Also, what accessories do you consider a must-have for instances like this? Q: I’ve worked hard to get in shape for my wedding, so I chose a wedding dress that will show off my figure. But, my soon-to-be husband’s family is quite conservative. Is there a way to accessorize my gown to make it more demure for my ceremony and then remove it for my reception? A: There are many removable accessories available to create a more modest look for the ceremony. “Detachable collars, sleeves, boleros and capes are just a few items that are available to tone down your look. The bridal salon where you chose your dress may have accessories to complement your gown, so start there,” says Sheri Rasmussen, owner of Sew Perfect. Q: My tropical destination wedding is rapidly approaching and I’m concerned about a family member’s style and whether or not she will wear something appropriate to the wedding. She tends to dress very provocatively and it often makes people uncomfortable. Since she’s going to be in all of the family photos, is it okay to ask to pre-approve her outfit? She’s easily offended and I don’t know how to broach the subject without hurting her feelings. A: If the ‘provocative’ family member is the mother or the mother-in-law, it is appropriate to consult them about their attire. It is customary for the mothers to choose colors and styles that complement the bridal party and are not conflicting with each other. In that case, you can have some input to help the mothers make decisions. If it is a guest that is the ‘fashion floozy,’ let the tongues wag and the eyes linger. You cannot control everything! Q: I’m getting ready to go wedding dress shopping and am super stressed out! I have a strong idea of what I want and the types of dresses I want to try on. My fiancé is very opinionated about style and what he feels I should wear on the big day. The problem is, our visions are total opposites. I want something more classic and he wants a dress that will show off my body. How much should I take my fiancé’s opinion into account when wedding dress shopping? A: When you are selecting your wedding dress, you need to choose a style that you feel beautiful and comfortable in. It is not uncommon for brides to choose one dress for the ceremony and another for the reception. Perhaps you might go for the classic look that you desire for the ceremony and then change to something more trendy for the dancing. Hopefully, your groom is not so controlling that he would overshadow your wishes. In days gone by, the groom had no clue what the bride would wear until she walked down the aisle! No matter what you wear, you will look your best and make his jaw drop. Q: I’ve heard horror stories from some of my friends about their wedding dress shopping experience. Some of them felt pressured or had their feelings hurt by the people they brought. Are there general guidelines to making wedding dress shopping as pleasant an experience as possible? It’s something I’ve looked forward to since I was a little girl and I don’t want to be let down. Parisian chic: it is one of the most desired, but elusive trends in fashion. There is just something nonchalantly beautiful about how the French girls do it. And their wedding style is just the same. Lauren Crispin knows this better than most. After spending years living and working in France, she is now the co-owner of The Mews New York, a new boutique specialising in French bridal couture. 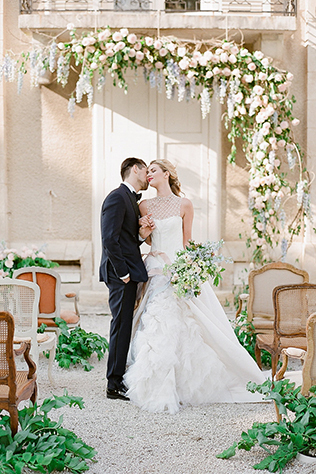 Here are her tips on how a bride can achieve chic, Parisian wedding style. Keep accessories to a minimum and don't overload your ensemble with too many pieces. The simpler, the better. Again, keep it simple, let your natural beauty come through instead of going over the top. French girls care very little about what others think of their style. Think about a bridal jumpsuit or layer a cool jacket over the top of a dress. A French girl would never be seen dead wearing a bejewelled dress. 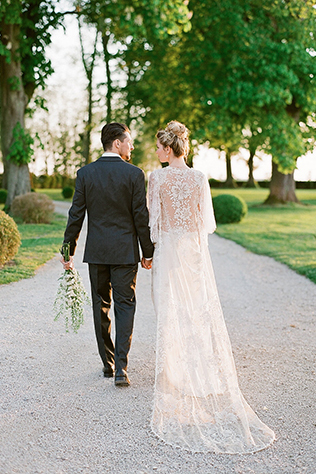 Keep the materials uncomplicated – silk and lace are a French bride's best friend. Rarely will you catch a Parisian woman strutting around in six-inch heels. The French designer Sezane is a Mews fave. Chic, yet comfortable, we’ll have a pair in every color! Now that you know how to perfect the ultimate French ensemble, you must top it off with the ultimate Parisian hairstyle. Look chic yet nonchalant with the perfect, “I woke up like this” flair. So, bring a bit of relaxed and effortless simplicity to your bridal style for a Parisian chic style and a sprinkling of je ne sais quoi. The Mews Bridal New York is the exclusive East Coast stockist of four Parisian bridal designers: Rime Arodaky, Delphine Manivet, Donatelle Godart and Margaux Tardits. The Mews Bridal also has two locations in the U.K. – Notting Hill and Clifton. If you’re just tuning in to our Destination: Paris week, be sure to check-out this week’s previous Destination: X posts: Paris Destination Wedding Resources, Paris, France Wedding Advice, A French Destination Wedding and French Château Destination Wedding. Stay tuned tomorrow for a fresh French real-life wedding! Photos courtesy of (in order of appearance): Stephanie Brauer (1st-20th), Mariela Campbell Photography (21st-38th) & Alea Lovely Fine Art Photography (39th-52nd).